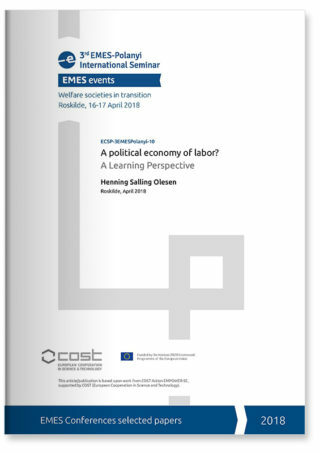 This paper outlines a link between the critique of the political economy of capital – in line with Marx – and a conception of economic democracy based in the everyday experiences of working people. Theorizing learning in and for work life in a way which discovers what the political economy of capital disguises is seen as the material basis of developing new forms of social relations and democracy. A “political Economy of Labor” must conceptualize the needs and interests of the working people and the qualitative and material aspects of work life – as opposed to the exchange values and the “dead labor” which form the basic elements of the political economy of capital (Negt, 1984; Negt&Kluge 2014; Salling Olesen, 2009).Until now the relation between economy and political processes is mostly thought of as a relation between quasi natural economy and modifications enabled by the state. The Social Democrat Welfare systems are based in the redistribution of revenues and the provision of services that tend to be neglected or under-prioritized in a capitalist market. This model is under siege, both in terms of power and in terms of legitimacy. This paper will point to the potential for democratic social change based in the everyday experiences of work, depending on how the processes are understood and organized. The scientific task is to develop methods and theoretical tools to help excavate and understand these experiences and to help to form a vision/theory of the possibility of organizing the entire complex modern societal work and the exchange process as a (political) economy of the living workers. The response to these great issues may be found in empirical investigations at the micro level – among others in the study of work and learning. The present state of capitalism – where industrial as well as the colonial tools for profitability are being exhausted – has in a way already set this scene – manifested in the interest in human resources, lifelong learning and emotional labor. The notion of a political economy of labor is a theoretical framework in which the material (evolutionary and historical) development of the capacity to work is analyzed as a process of learning and self-regulation (Negt & Kluge 2014). Within this framework you can analyze work – also present day work under capitalist circumstances – as life processes in which concrete subjects relate to each other, to their work objects, their tools and their products. The framework will focus attention on the zones of learning and self-regulation which are sometimes neglected. The framework has potential to provide a new perspective on the learning processes defined by the needs of work or what is going on in work, consciously or unconsciously. I will outline the political challenges set by the political economy of (global) capitalism and discuss the potentials for a new democratic Marxism based in the experiences of working people. From this I will discuss the role of learning in and for work as a matter of producing self-regulative capabilities that may offer a material basis for a new democratic and sustainable political economy.